The other morning my roommate and I had a few friends over for a pre-work brunch. In the future, I would not suggest this because even after two mimosas I was in need of a nap. None the less, the brunch was delicious! We ate a strawberry coffee cake, fresh blackberries and this vegetable and egg casserole. I needed something easy to whip together in the morning and filled with fresh vegetables. I found this recipe on Pinterest and decided to give it a try. It was delicious with a little bit of hot sauce and made for great breakfast leftovers the next few days. It took approximately 15 minutes to prepare the ingredients and 30 minutes to cook at 350 degrees. I was cooking for four people so I halved the number of eggs but kept the amount of vegetables the same. 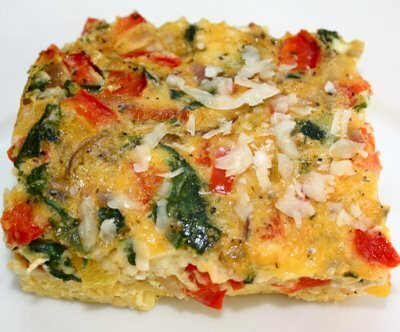 Great for a weekend breakfast or a quick breakfast to heat in the microwave throughout the week. 1. In a large bowl, whisk together the 18 eggs. Add a splash of milk. Add salt and pepper to taste. We also used Spike seasoning, 1-2 teaspoons. If you don’t have this, try Italian seasoning instead. 2. In a large skillet, saute the peppers and onion in a little bit of olive oil. 3. Add in the spinach for a minute or two. 4. Pour the eggs in a greased 9 by 13 Pyrex dish. Add in the sauteed veggies and tomatoes. Stir everything in the pan. 5. Stir in mozzarella cheese. Make sure everything is distributed evenly. 6. Bake in a 350 degree oven for about 35-40 minutes or until the eggs are set and golden. 7. Sprinkle the casserole with Parmesan cheese if you wish.